Ohhh my darling Summer. Please don't go! I will miss your tomatoes and sweet corn so!! Is it just me, or does anyone else find that the closer it comes to end of Summer, the more your gorge yourself on all of the fabulous fresh produce you will not have until the next year? Yes, technically, you can get some of them further into the year. But they are never as good as they are right now. So I am like OMG OMG I must eat them all for every meal!! Ya, I am a little nutty sometimes. You should try living with me. Just ask Kevin, he would probably advise you to run the other way without looking back! But he is pretty used to all of my neurotic quirky behavior by now. This year we have actually both become obsessed with grilled corn on the cob. I have always loved it this way, but for some reason Kevin hadn't jumped on board with me. He preferred his corn on the cob slathered in butter, sprinkled with salt and pepper, and wrapped in foil, before tossed on the grill. Don't get me wrong, that makes for some pretty ding dang tasty corn, but something about just slappin' those bad boys nekkid on the grill. Letting that grilled char it up a bit and develop the sugars PLUS add that hint of smoke. OhhhEmmmGeeeee I am drooling now *sigh* it is so hard to type when I do that! Ahhh the hazzards of being a food blogger. Being from Southern California originally, San Diego specifically, I had been introduced to elote (Mexican Street Corn) when I was a teenager. And believe you me that was a love affair at first sight, errrr taste. Salty, creamy, sweet......ohhh myyyyy! I can remember buying it off of a little cart and completely demolishing it before the little man with a bell had a chance to walk away. "Uno mas por favor!!" came out of my mouth before I could even think about it. So nice to know those years of high school Spanish paid off! So this year, after eat countless cobs of corn from my grill, I decided I needed to come up with new tasty ways to enjoy it. Well, why not combine my beloved elote with one of our favorite classic side dishes? Yes, why the heck not! Good Lord what took me so long to do this? Kevin and I loved this so much that we actually arm wrestled over the last bowl of it. No joke, down and dirty. I won. Of course I cheated, but a girls gotta do what a girls gotta do to get her grub on! This pasta salad is sweet, creamy, salty, and crunchy, with a hint of spice to it. I could go on and on about it, but that would stop you from getting in your car and heading to the store to get some of that end of summer corn to make this with. What are you waiting for? Get going!!!! Heat outdoor grill to medium-high heat. Brush corn with vegetable oil. Grill, turning frequently, until slightly charred on all sides. Allow to cool. Bring a large pot of salted water to a boil. Add pasta and cook according to package instructions. Drain. 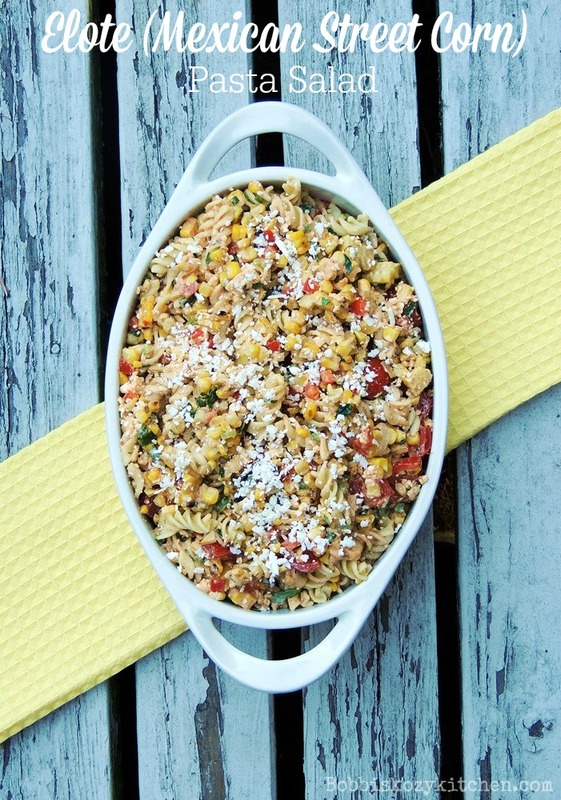 In a large bowl, combine the pasta, tomato, bell pepper, green onions, jalapeno, cilantro, corn, and cheese. In a small bowl, combine the mayonnaise, Greek yogurt, chile powder, and lime juice. Pour the dressing over the pasta mixture and stir to combine. Spoon into serving dish and sprinkle with remaining cheese.